Orders for posters that are flat/bulk rolled usually ship within 3 business days. Individually rolled and labeled or boarded posters usually ship within 7 business days. This is for the continental US. See below for international. We understand that the sooner we ship, the sooner you get your posters, the sooner you can sell them, and then the sooner you can reorder them. We always try to get your orders out ASAP! Seasonal demands and other factors such as weather may affect this timing however. If you have a specific deadline, please contact us before placing your order and we will do our best to accommodate you. After shipping, most orders to the East coast arrive within 3-7 business days, West coast 2-5 business days. Canada 3-10 business days. United Parcel Service / UPS is our preferred shipper. The shipping charge is the actual UPS rate based on weight, distance and as of January 2015 they also charge for the size of the carton. This is known as dimensional weight. It doesn't have too much of an effect on our shipments of flat/bulk posters but the rate for shipments of rolled posters has increased by 5-20% since the change. The actual weight of a carton of 80 rolled posters is approximately 18 pounds but due to the dimensional weight, UPS charges are based on 25 pounds. This means if you order less than a full box, UPS will still charge you for a full box. Shipping charges are a "pass-along" for us and not a profit item. The web site will automatically add the UPS charge as you fill your cart. If you would like us to use YOUR UPS account number, please add a note with your shipper number to your cart at checkout. We will refund the automatic charge and you will instead be billed by UPS. UPS has a substantial surcharge for residential addresses, so wherever possible, we recommend your provide a commercial address. UPS does not deliver to p.o. boxes. We are aware that in a limited number of instances our cart will charge for residential rates even though your address is commercial. When this is identified at the time of shipping, we will issue a refund for any overcharge. INTERNATIONAL ORDERS: The shopping cart does not currently calculate overseas shipping rates. Please place and pay for your order and we will contact you with the shipping charges and invoice you through Paypal. You do not need to have a Paypal account. DHL and UPS are our preferred international shippers. Please allow up to 21 days for delivery. Please note that we can only ship the posters flat/bulk rolled and not individually rolled when shipping outside the US or Canada. Any import fees, duty, taxes, customs brokerage etc. are the responsibility of the buyer. As every country has it's own policies, we ask that you please contact your local authority for details on potential charges. 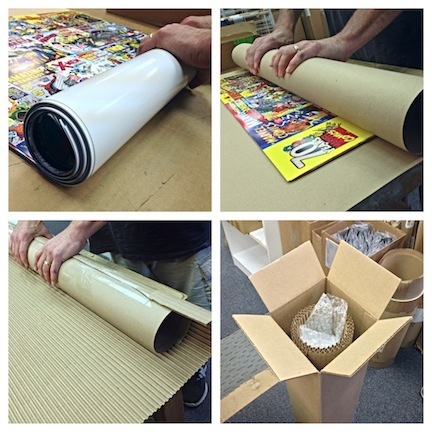 We have over 30 years of experience packing (and unpacking) posters. Our technique and use of packing materials has been time tested and we'd like to think perfected but we are always interested in hearing your feedback and suggestions. You will always have consistency in the materials and method of packing with every one of your orders from us. While we are dedicated to recycling, we do not "dumpster dive" to find & re-use outer cartons as they tend to degrade with each use. Our cartons are custom sized and constructed to minimize shipping charges and ensure the safe arrival of your order every time. You will not see us using packing peanuts or old newspapers although we do use old poster stock (anyone want 1100 Hangover Part 3 posters?) as stuffing when a box isn't quite full. This is our custom made double-wall horizontal flute box (empty) holding a 175 lb warehouse guy. Your posters are laid flat in a pile and rolled together in a kraft paper liner and outer corrugated layer. Both layers are wider than the posters to protect the edges. The roll is then placed into a sturdy box for shipping. Placed in a sturdy carton that is slightly taller than the posters to allow for padding at the top and bottom to minimize the risk of dropping damage. These double wall cartons are custom manufactured to the specifications we developed over more than 30 years of shipping and receiving posters.